Ambassador of Vietnam to India Pham Sanh Chau calling on Assam Chief Minister Sarbananda Sonowal at latter's office at Janata Bhawan on Wednesday. Ambassador of Vietnam to India Pham Sanh Chau suggested Assam Chief Minister Sarbananda Sonowal to adopt an export-driven growth model for the State’s economy as practiced by Vietnam for rapid economic development. 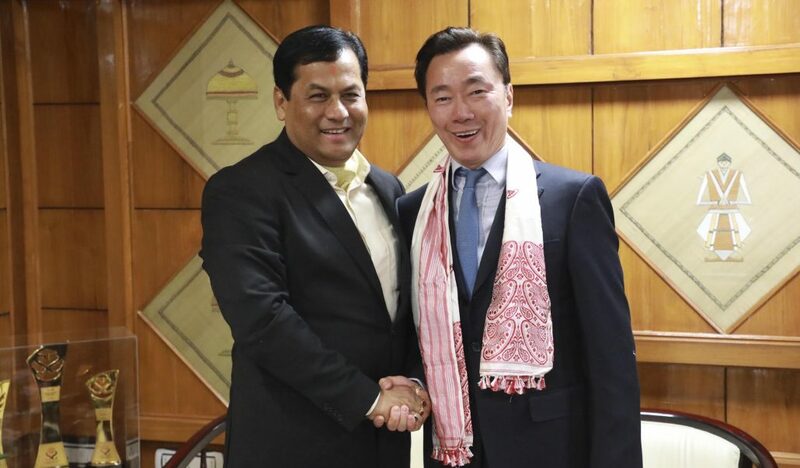 Ambassador of Vietnam to India Pham Sanh Chau made the suggestion while he called on Assam Chief Minister Sarbananda Sonowal on Wednesday at the latter’s office at Janata Bhawan and discussed various issues of mutual interest. Stating that both Assam and Vietnam must explore opportunities of business and economic activities, Assam Chief Minister Sonowal proposed that an exchange programme of farmers, start up entrepreneurs, scientists and students of both countries every year so that people from both sides can benefit from the expertise and know-how in different fields. The Vietnamese ambassador responded favourably to this proposal and assured to take it up with his government on a priority basis. The Assam Chief Minister also expressed his satisfaction that the State’s farmers taken to Vietnam on an exposure trip last year have been able to utilise their experiences gained on the trip and increase their production. The visit to Vietnam Academy of Agriculture Sciences was also very enriching and the State’s farmers could get insight into the latest agricultural practices there, he said. “Your practice of adding value to the products supplied from our country like fish and making them suitable for European and other markets thereby making substantial profit is something that we must learn from and emulate. Today’s meeting should pave way for the dynamic relationship between Assam and Vietnam and a robust exchange programme for increased people to people contact,” the Assam Chief Minister said. Vietnamese Ambassador Pham Sanh Chau also expressed his interest in developing deeper relation with the State and engaging in ‘rhino diplomacy’ as one horned rhino is common to both Assam and Vietnam. He also suggested the Chief Minister to adopt an export driven growth model for the State’s economy as practiced by Vietnam for rapid economic development. Legal Adviser to Chief Minister Shantanu Bharali, Additional Chief Secretary of Industry and Commerce Department Ravi Capoor, Principal Secretary to Chief Minister Sanjay Lohia, were also present during the meeting.